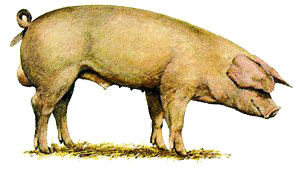 The Landrace strains of swine were first introduced into France around 1930. It was not until after World War II that extensive importations of registered stock were made. Those imported came largely from Sweden. At that time Denmark was quite restrictive of exports. Selection in France was being heavily directed for swine that suited the production environment and the market requirements of France. French Landrace are a large white breed with heavy drooping ears that point forward in the characteristic Landrace manner. They are a breed that has been selected for skeletal soundness, heavy muscling and for prolificacy. Sows of the breed are said to average 19.7 pigs per year in France. Good mothering ability has been especially stressed. The hams are bulging and the rump is level and wide with the loin being very muscular. The breed has performance characteristics that very closely approach the Large White with which it has been consistently compared. The length of carcass, freedom from fat, and bacon quality have been especially commendable. Feed conversion efficiency has also been a very favorable point for the French Landrace. The French Landrace has proven to be very popular for crossbreeding in the country from which it takes its name. At first, they were referred to as "French Swine of Danish Type," and then gradually by their current name of "French Landrace Swine."' The breed is commonly used as terminal boars in three-way cross programs or as the sires of crossbred sows to be used in such programs. This French strain has also been exported to a number of other countries. Careful selection programs among the breeders of France have resulted in a specific strain of the general Landrace type, found so widely in Europe, which constitutes a worthwhile addition to the germ plasm for those desiring the advantages of productivity and carcass quality offered by the Landrace breeds. In France, as well as in other countries, certain specific characteristics have been especially emphasized and developed through true breeding.